Last week, I was beyond honored to join the Home Depot in Atlanta to swing my hammer in support of our military veterans. The Home Depot (and it’s non-profit Home Depot Foundation) is wrapping up its “Celebration of Service” projects, where it completed 200 service projects and donated $9 million in grants to enhance the lives of U.S. military veterans and highlight the needs and opportunities they face. Friday (Veterans Day) was the final day of projects, which is where my hammer swinging came into play. 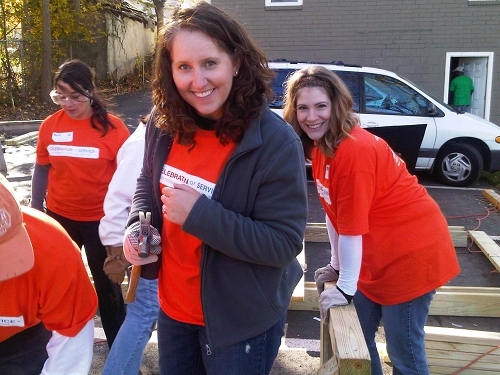 A group of 9 bloggers, along with many Home Depot employees, worked on refurbishing housing for homeless veterans. There were quite a few projects being worked on that day, but my specific task was to build a few wooden benches. Kate from Centsational Girl (left) and Stacy from Not Just a Housewife (right) were on my build team, so we certainly had a team that knew its way around power tools. For the next three years, the Home Depot Foundation is placing special emphasis on serving U.S. military veterans who are facing growing financial and physical hardships at home as they return to civilian life. They will invest over $30 million to help ease the burdens of this deserving group by repairing and renovating homes for military veterans. This year alone, they have contributed $9 million toward that goal. 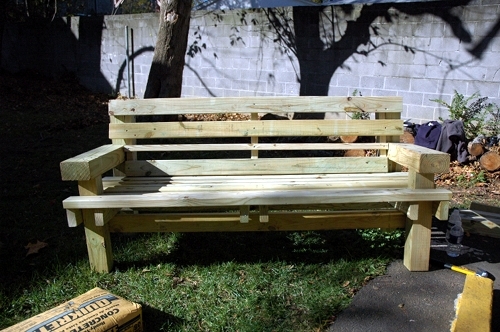 My little part of the “Celebration of Service” was building this bench for the group of homeless veterans in Atlanta. It was a fun project (once we deciphered the plans! ), and it’s a nice, solid bench. Your little part is going to be to help me. I am looking for a Central Texas (Austin Area) military family who has a ‘Wish List’ of services from Home Depot for the Gift of Good Program. The family will need to provide 2-3 photos and a brief statement of needs. My chosen family is guaranteed to receive $500 worth of goods and holiday décor from Home Depot (I’ll be knocking on their door!) and then entered to win a $20,000 prize of home improvements from Home Depot. The family must own their home. For the purpose of this program, a military family is defined by a household that includes a resident who is either currently serving or is a veteran of any branch of the U.S. Military. Please send submissions or nominations to livingwithlindsay@gmail.com. Submissions must be sent by Sunday, November 20th. The nominated family will be confirmed via email on November 28, 2011. If you don’t live in my area, but know folks who do, please, please, please forward this blog post to them in case they know of a family who deserves to be nominated. What an awesome opportunity for you and for those on the receiving end of your service and Home Depot’s generosity. I am thinking about this. I am putting a call out to my ladies who may know of someone in that area that meets the requirements. It was so nice to meet you and work with you.